Wisconsin wedding band VO5, concerts, private party disco and funk heaven. Abba, BeeGees & more dance wedding party music. Do you want a 100% "there will be tons of dancing" guarantee at your special event? Then ask VO5 to come play at your party! For a reasonable price we will bring 9 musicians, a sound guy, PA and a light show to your special occasion or concert venue. We also include free DJ'ing and extra microphone for the MC. We'll make it all very easy for you and we're highly reliable (haven't missed a gig in 10 years). Please note that many weekends are booked 6 months in advance. We'll email you a large list of possible songs and can do special requests (Abba, Bee Gees, Michael Jackson and much more). And we'll dress up classy or extra funky, depending on your tastes. We are also open to run events such as dance contests or costume competitions during the night. Along with many weddings throughout Wisconsin, V05 has performed for large crowds (think of the UW-Madison Terrace on a Saturday summer night) and at corporate events (such as the 2009 Wisconsin Realtors convention) along with other fancier venues (Overture Center for the Arts) and outdoor festivals (Isthmus King Street Block Party & Atwood Summerfest). 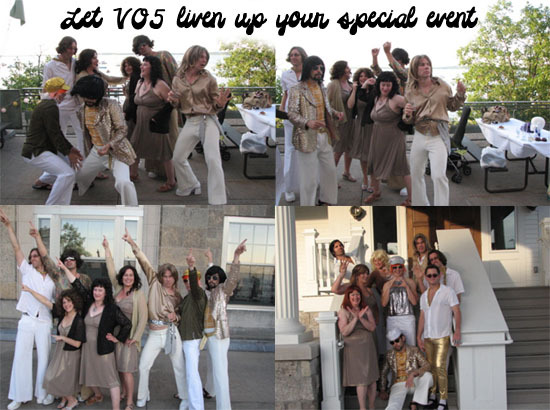 So shoot us an email (vo5@caculo.com) or call 608-445-7375 to arrange a grand dance party. "I have to tell you a story. I was riding the bus on home on Sunday evening. The driver was new and was getting trained that evening. As the bus passed the Crystal Corner Bar the driver and trainer began talking about the bar and bands they both had seen. VO5 came up in their discussion and the driver and trainer both agreed that VO5 was fantastic. They also thought you had "the funk for a being all white." Gloria V.
"You guys are the most fun live band to dance to... You kept everyone jumping all night... Keep it up... Looking forward to your next performance." Jenny M.